Remember the days of the blog world when there was a new bar out every week? Remember those big plank bars I used to eat? I probably tried 100 different bars in 2009! There really isn’t a more convenient on-the-go snack. Larabars continue to be my favorite mass-marketed brand. I always have the minis on hand in my diaper bag – Mazen thinks they are cookies! 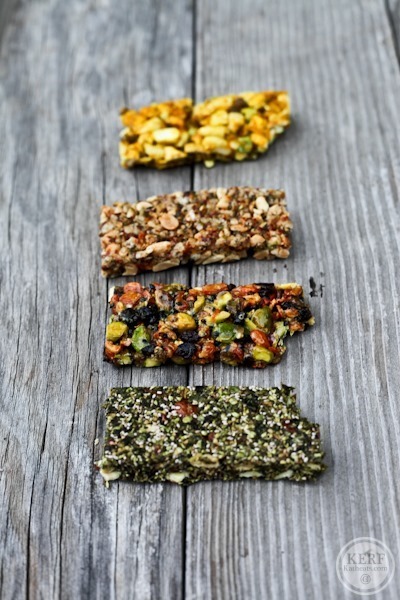 There are still new bars coming out all the time, and here are three that are unique and delicious – healthy too! 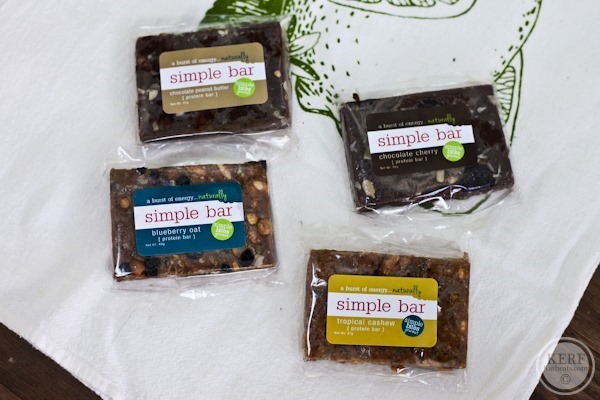 Simple Bars were created by a friend of a friend of mine who also happens to be a blog reader! When we made the connection, Erica sent me some bars to taste and share. Erica went to culinary school and has a BS in Nutrition. She is now a marathoner and a mom who lives in Birmingham (where she met my friend Nelle). Simple Bars are gluten free, dairy free, no preservative protein bars that come in 4 flavors: Chocolate Peanut Butter, Chocolate Cherry, Blueberry Oat and Tropical Cashew. Taste test? They are delicious!! Kind of like a Larabar with big chunks of nuts. Of course the Chocolate Peanut Butter was my favorite. You can buy them online if you’d like to try ‘em. On the local front, Speedie B’s are awesome bars made in Cville. I first discovered them at our farmer’s market and bought – guess which one – the Chocolate Peanut Butter. It was incredible and I Instagrammed it during a car trip. Their creator, Bea, saw the ‘gram and emailed me and asked if she could give me the other flavors to try too. They are all great!! Their texture is chewy with lots of chia seeds for crunch. I love the addition of oats too – they are super doughy! 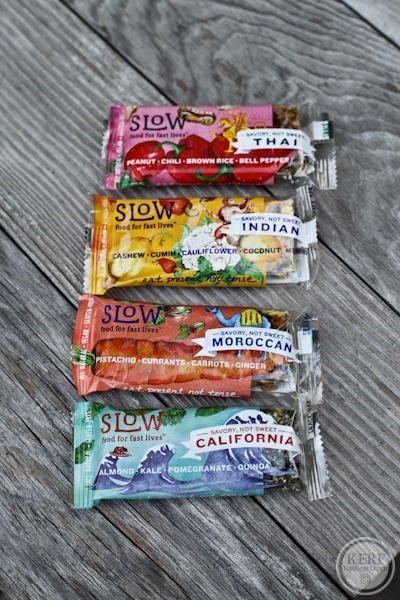 Slow Bars are a super savory bar new to the market. And when I say savory I don’t mean dates with a little veggies mixed in…I mean S.A.V.O.R.Y. I can’t really say these bars are my favorite, but I do love the concept! 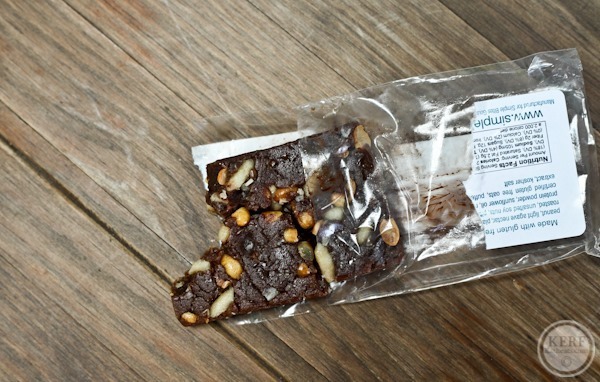 They are made with real food – dehydrated veggies, seeds, dried fruit and spices. Lots of spices! The Moroccan was my fav. If you’re looking for something wild for your taste buds that won’t give you a sugar high, these are for you. Mazen’s preschool (and our gym’s daycare) are nut-free, so I’m always looking for good recipes to send with him as snacks. I made these Apple Oat Bars from Anne’s blog that turned out great. (I omitted the walnuts.) Mazen thinks they are cookies! I absolutely love the chunks of baked apple. 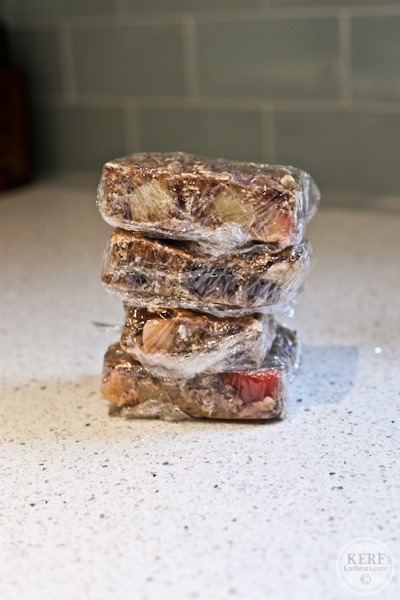 Whenever I make homemade bars I wrap them individually and put them in the freezer. I pull one out before we leave the house and by the time we get to our destination it’s ready to eat. Other good options: Emily’s Date Coconut Balls, Gina’s Amazeballs and Anne’s No Bake Peanut Butter Bars made with sunflower butter. What’s your favorite bar these days? Larabars are still an old standby for us, too. I make a lot of my own bars, as well. Thanks for sharing these, Kath! I haven’t tried any of them yet, nor have I seen them here in Canada but I’m going to look next time I’m at Whole Foods. 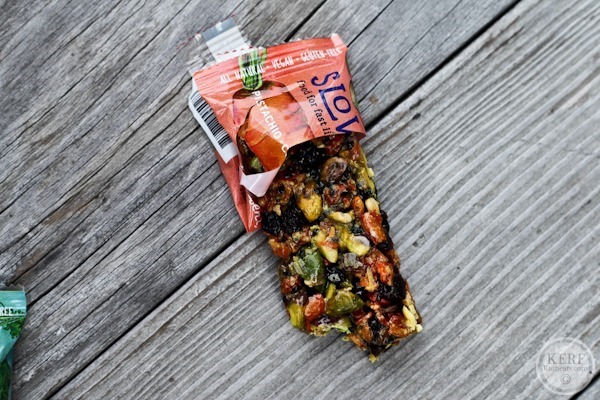 I’ve never really tried a savoury bar like Slow Bars but I can see how endurance athletes might enjoy them since gels and sweet liquid nutrition can get a little bit hard to take after a few hours! My favourites are the newly re-formulated Vega bars (the Vega Sport ones and Vega Snack ones), as well as my own homemade creations. I am a bar LOVER so I am always looking for new ones to try! Can’t wait to check these out! The slow bars seem so unique! The savoury bars look so funky!!! I’ve been making truffles with avocado and white chocolate ones with pure cacao butter and fresh vanilla….for a little indulgence! 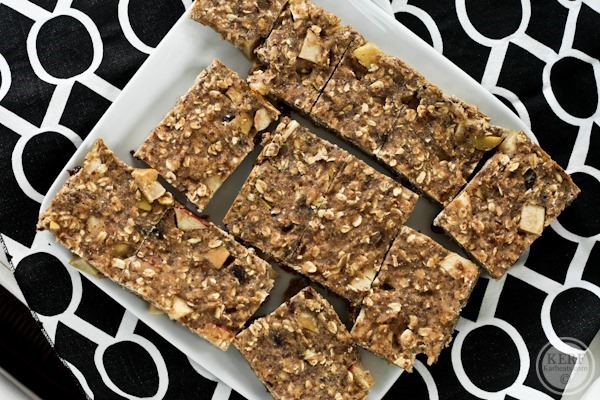 The Apple Oat Bars sound good. Apples, oats and cinnamon – a great combination! 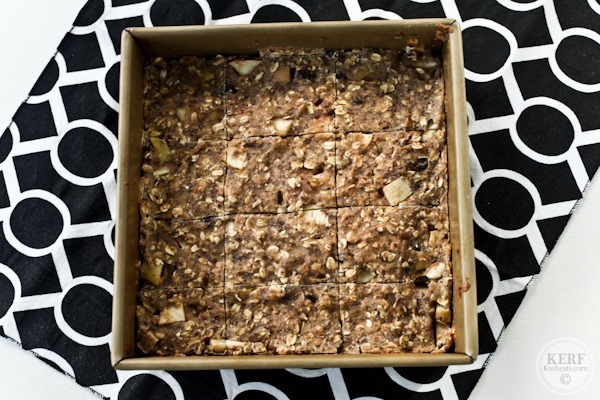 Those apple oat bars look delicious! Perfect for peak apple season coming up! I too have really enjoyed homemade bars. I’m actually testing out different recipes for after the baby arrives. I want to have healthy snacks on hand, especially for breastfeeding. Those savory bars are very intriguing! The Thai one sounds delicious. I’m a big fan of Larabars too, and will buy Kind bars when I’m feeling indulgent, but that’s it. Those things can be pricey! And with my husband and I and now the two-year-old eating them…. I guess I need to figure out how to make my own! I love Pickybars! They were created by professional runners for runners and have the perfect post-run recovery ratio of protein to carbs. The smooth caffeinator flavor is SO GOOD. Skout bars are awesome! I love the apple cinnamon, peanut butter chocolate, and blueberry flavors. I’ll always have a place in my heart for Larabars and Larabar ALTs (10g protein)! Thanks for posting the bar recipe! With three toddlers, I’m always looking for healthy kid friendly recipes! I’m still kind of loving Larabars because they’re perfect for keeping me full in class before I can have lunch, and they’re not really messy or obvious. The savory bar sounds super interesting. I’m not sure I’m brave enough to try it since I have it stuck in my mind that bars are sweet but what a cool concept! I read thru Anne’s apple bar post and noticed that she didn’t want to figure out the nutrition for the bars. That always makes me suspicious so figured it out for her: servings: 9; for 1 serving: 312 cals, 6g fat, 9g protein and 57g carbs (!! ), 18g sugar. I wouldn’t call these a well balanced snack at 70% carbohydrate! For the same cals/protein combo you could have 3 tbs peanut butter: 280 cals/10g pro. For cals/fat, 4 apples: 320 cals/4g fat and for carbs, 5 Oreos: 320 cals/50g carbs. 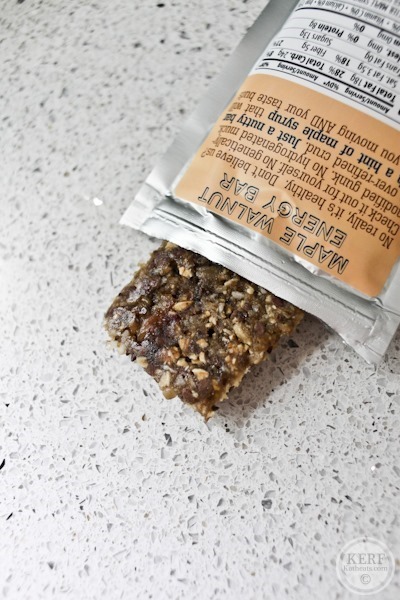 They seem a little weird at first, but so tasty and packed with protein: Epic Bars! The Bison, Bacon, Cranberry is my fave. Also, Ancient Grain Pure Bars are delicious. I always love Larabar Chocolate PB Chip, but it’s not very filling or filled with protein. However, I really like Zing bars – they were created by a bunch of RDs from Bastyr University in Seattle – cool concept and delicious flavors – love the Choc PB of them too. However, Speedie Bs and Simple Bars look really really good. I love maple flavor!!! Thanks for sharing! I love the convenient of bars, but of course am a stickler for ingredients. Teachers some panic and the kids some time so they won’t have to wait to eat while the school calls mom! I swear by Bobo’s Oat Bars. I especially like the cinnamon raisin. They are really filling and keep me full for a solid 4 or 5 hours until lunch time. Great breakfast on the go! I always have a larabar on hand! Although I also love KIND bars, they are just more expensive than Lara;) Thank you for including some make-it-yourself options, I am in cooking mode this weekend and am adding these to my list! Yumm, I’ve never heard of any of these bars before, so I’m going to have to check them out. Especially the savory ones – how interesting! Right now I’m loving the Health Warrior Chia bars. They are the perfect amount of chewy and crunchy and full of chia magic! Where did you get the pan use used to make the apple bars? I loved this post! I was recently in the grocery store comparing all of the nutrition labels on different bars. I noticed that a lot of the popular ones have very little protein or fiber and have a ton of different ingredients. 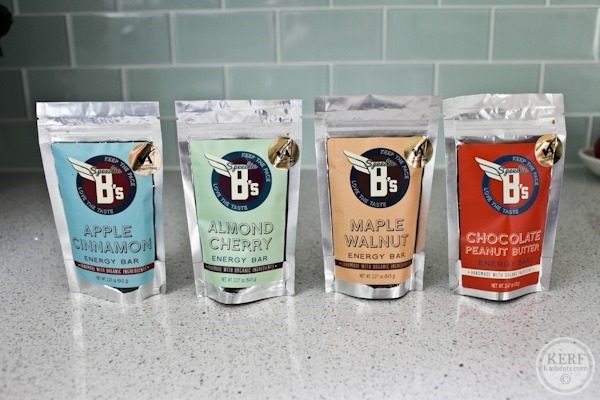 Anne’s bars look awesome… I will have to try them out! 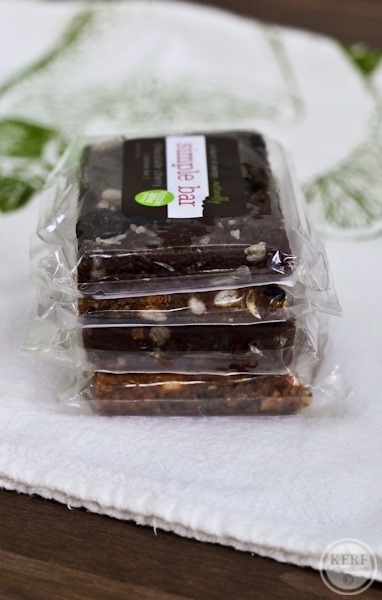 I like the idea of making bars at home — thanks for sharing Anne’s recipe! I love supporting local businesses… But I probably wouldn’t buy the Speedie B bars on account of what seems like excessive packaging. When I shop, I generally try to minimize the amount of plastic I have in my basket. It’s a pretty good indicator for the amount of processed food I’m taking home to my family. Have you tried the Epic bars? I grabbed a Turkey Almond Cranberry one at Whole Foods, but I am having a hard time enjoying the taste of it (in fact I couldn’t get past the first bite, tried a bite the next day, still didn’t care for it and put the rest away to try later). I love mixing sweet and savory flavors together, but I am just having a hard time with the texture and flavor of this bar, maybe I need to try the other flavors like the Bison Bacon Cranberry flavor. I think I might like the Slow bars, where did you find them? I tend to make my own bars, but I also have been keeping a few of the 2 ingredient Apple + Coconut Trader Joe’s bars on hand. Thanks for the recipe ideas. I second Bobo’s Oat Bars! You would like them. Hint: first ingredient is organic rolled oats. 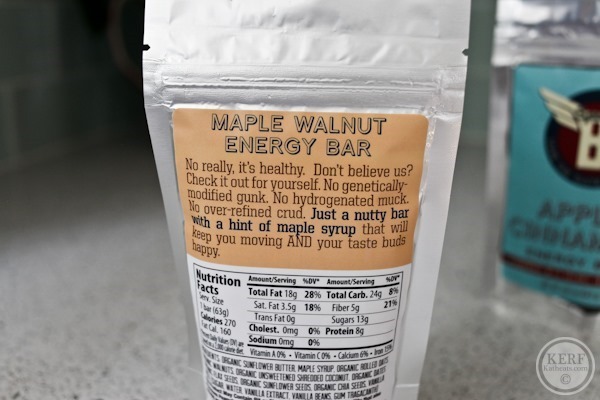 I’m going to have to try these bars! I’m always looking for new bar recipes and can’t wait to try these. I call ours cookies too and my son never knows the difference! As someone who lives in a nut free household I am so very thankful to hear of daycare and preschools being nut free – as a former nut liver myself I can say first had after you have seen someone you love go through anaphayxis you will never want to touch a nut product again. I did want to check in though when you mentioned you sent treats to your sons school are you careful in your kitchen to avoid cross contamination? Do you ensure all bowls/ utensils you use are washed on a heat cycle in your dishwasher before you make a but free treat? I’m obsessed with Cliff bars both oatmeal raisin and white chocolate. S/n: Guess who has two thumbs and picked up C’ville Crunch, granola DNA doggy biscuits? This girl!!! And I love Sidney. She was so friendly. I would have gotten lemon bars and the cinnamon crunch bread if I wasn’t going to tailgate. I love bars but get sick of always having a sweet snack on the go. The Slow Bars look like the perfect solution.